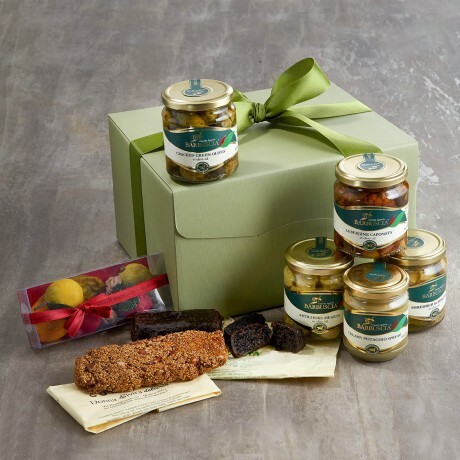 Bring the delights of Sicily to their table with this hamper packed full of mediterranean goodies! Anyone who visits this island comes back raving about the incredible food – from the wonderful vegetable caponata and sweet artichoke hearts to the colourful hand made marzipan fruits and sesame and honey torrone! We’ve included all of these treats! Sicilian Shredded Aubergines (314ml) These slightly spicy crunchy Sicilian aubergines have a bold flavour making them ideal for an aperitivo or a snack in their own right. Sicilian Pistachio Spread (212ml) Heaven in a jar for pistachio lovers!! This rich, creamy and dense paste is made from the best Sicilian pistachios. It’s delicious eaten alone straight from the jar or spread on a slice of bread or at Christmas time on Panettone. Packed full of nutrients, this sweet but healthy spread is also a popular filling for Sicilian cakes and desserts. Dairy Free Modican Chocolate with Avola Almonds (70g) From the ancient Aztec tradition comes this unique crumbly chocolate bar. A must for chocolate lovers, Donna Elvira Modica chocolate is a chocolate full of history made following ancient manual Aztec methods. Cold pressed and stone ground, this chocolate is never heated above 45 degrees, resulting in an intense almond flavour and incredible texture. Cedrata (200g) Exclusive in the UK to Vorrei this is an incredible Sicilian dessert that you most probably won't have tasted before! Hand made in Donna Elvira's family run 'laboratorio', the Cedrata is a deliciously moist, soft and sweet creation with an incredible citrus flavour, crafted from Sicilian cedro (citron) peel, honey and organic cane sugar. Torrone Cobaita (200g) This delicious Sicilian Torrone is a regional speciality which has been hand made in Donna Elvira's family run 'laboratorio' in Modica. The Cobaita is a sweet and crunchy Torrone made with all local produce. Our Sicilian treats are presented in a lovely strong box which is hand tied with a big red ribbon. A gift message option is available at the checkout. Please note that if we are out of stock of any item we reserve the right to substitute it with the most similar available item. Allergens: pine nuts, celery, pistachios, soybeans, milk, whey, almonds.